Dana Gusman modeled jewelry made by Adina Reyter at Cottage by the Sea Monday. Adina Reyter may not have been looking for celebrity status, but it definitely found her. Demi Moore was the first celebrity to purchase pieces from her Adina jewelry collection. Soon after, Jennifer Aniston walked into Reyter's Beverly Hills shop and bought the entire lot, wearing one of the pieces on an episode of "Friends." Other well-known actors that have been seen wearing Reyter's popular necklaces include Hayden Panettiere, Christina Applegate, Cameron Diaz, Brooke Shields, Reese Witherspoon, Marcia Cross, Teri Hatcher, Felicity Huffman, Debra Messing, Heather Locklear and Eva Longoria. Reyter began by taking metal classes and making jewelry that people wanted to buy off her neck. "People would stop me on the street and ask where I'd bought my necklace," she said. "I've never been obsessed with jewelry, but I really like design." Simple, sophisticated, feminine, wearable and ageless are a few of the qualities that might explain her jewelry's popularity with a broad spectrum of people. "I wanted something that could be worn with jeans and a T-shirt, to the office or out for the evening." Shoppers will be able to see for themselves when Reyter's collection is featured during a trunk show beginning this weekend at Cottage by the Sea. Normally, only a handful of Reyter's sterling silver pieces are available at the shop. Shoppers will receive a 20 percent discount off the silver pieces and a 15 percent discount off her gold and diamond collections during the event. The discounts also apply when ordering from the website at www. cottagehawaii.com. Each necklace comes with an empowering message, such as one on a disc necklace reading, "Discs are shapes representing inner strength and power. Every woman is both strong and beautiful. These discs celebrate life." Inspiration is found lurking everywhere, Reyter explained. "My discs are concave and interesting, like an Asian bowl," she said. Her parents' hammered wedding bands led her to make hammered pieces and, eventually, twisted metal necklaces. Reyter always aspired to own a creative, low-tech business. "My family owned a knitwear business, so I spent lots of time watching them ship items, made visits to the warehouse," she said. "I knew it was attainable. In the U.S. anything is possible; that's what this country is all about. My business is my first baby, I've had to nurture and grow it like a child." Her plans include more high-end pieces with diamonds and lower-end pieces that will be sold under a different label. Although she says her design aesthetic is always evolving, she plans to keep the uncluttered, contemporary, ageless look. 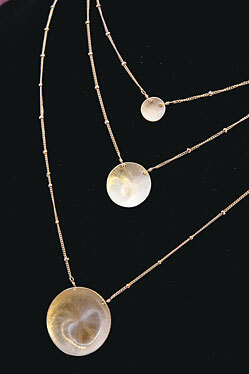 "I want to continue to make pieces that can be worn all the time. I don't see myself doing dangling chandelier diamond earrings anytime in the near future. "Jewelry is all about the details. If you pick it up, it should feel good," Reyter added. "My pieces are very collectible. And, you can add additional pieces for a more dynamic look."